Sequestration, Where is the Reality? Obama said again today, “The rich must pay their fair share.” I think they already do. The rich aren’t building businesses in the USA, they have moved overseas to increase their profit margin and reduce their labor costs. This country wasn’t built by stupid people but it kind of looks like its run by stupid people. Every government agency has a budget, and at the end of the year, if they don’t spend it, they have to turn it back in to the government. Have you ever heard of any part of the government returning money because they didn’t have anything to spend it on? What would happen if instead of each department trying to spend the money, the person in charge got 20 percent of the budget not spent, as a year-end bonus split with the people under him? When you examine government, it is not designed to cut costs, where is the incentive? They won’t go bankrupt. It’s not like they have to make a profit. Plus there is no accountability to the taxpayers. My question: If 85 billion in cuts is going to upset the apple cart, then why are we spending 1.5 trillion more than we take in in taxes? What makes the 85 billion in cuts painful, but the 1.5 trillion in extra spending that is borrowed money, painless? Of course, if Congress doesn’t plan to pay back any of the 16 trillion dollars; I can see where the 85 billion is a real setback to their spending programs. They went to the trouble to print it and now they’re told they can’t spend it. When funding is cut to a government agency, you get the negative get-even feedback "How dare Congress cut our budget, we will cut services that will maximize taxpayer discomfort." There is no Gung-ho push of a "Can Do" attitude, we end up getting, it's "My way or the highway." 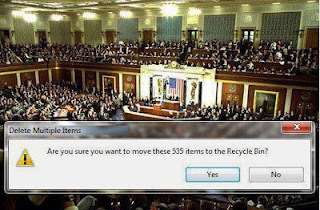 Common sense suggests if Congress cuts the funding, the government should cut the bureaucratic enforcement that goes with it, it's called downsizing. However, if a government agency wants to impress how important their part of the bureaucracy is, they don't downsize, they enforce the regulations more vigorously with less man power. The kids on the free lunch program can throw away their 35 cent apple every day while you wait in longer lines to check on to your flight---they win if you get upset, go figure! I go to the pet store every three weeks to buy millet sprays for my Parakeet. Last year they were 3 for a dollar. This year the price went up to 45 cents a spray. Today they were 95 cents each. The treat part of my parakeet’s food budget has jumped from 17 dollars up to 52 dollars a year. I only paid 12 dollars for the bird, but the concept that the 52 dollars is just for bird seed, makes me see the world in a different light. Of course, this must be a special case, and we should disregard the data. But what’s my reaction? The special treats for bird just aren’t going to happen as often anymore. The pet store raised their prices and now the bird has to make do with two sprigs of millet a month (Bird gets a tray of regular seed also, so he’s doing OK-- The millet is just his snack food)(Republicans don't starve their pets by waiting for handouts like Democrats)--(I'm joking here). We’re not getting rid of the parakeet, but we will probably get rid of our cable TV. They want 15 dollars a month for 7 Spanish stations and 6 infomercial stations. I don’t speak Spanish, and this is supposed to the United States (figure that out). I can get PBS and the three news channels with just a TV antenna. What we are really looking at here is the fact; we are getting less for the same amount of money. Not to mention a reduction in the quality of the product being sold. Of course, not everything is depreciating. I had a bunch of old gold and silver items that I’ve had for many years. A gold dental crown, two gold rings and a gold chain (20 grams in all) and about 3 ounces of scrap silver, like cuff links and tie clasps and took it down to the local coin dealer and got about $650 dollars which I converted to 20 silver maple leafs. My wife was so impressed; that she rummaged through her old junk jewelry (the stuff you get for Christmas) and we took that down and got another 20 silver maple leafs. It’s kind of surprising to see what you have just lying around the house that you wouldn’t think twice about. Below is a picture that has been circulating around that I found humorous. Some of you have may have already seen it. It tends to suggest that there is a certain frustration with the way Congress is malfunctioning as of late. The Coming State of the Union Speech. The Republicans in Congress are in a bad position. Whatever happens to the country, it will be their fault no matter what and the Democrats know it. Obama in his State of the Union speech will cover Immigration, gun control, jobs and the economy. His main theme will be “And by God, if the Republicans will work with us, we can get things done.” He got his health care through without Republican help; why does he need their help now? It brings to mind the phrase "It's payback time!" Employment is up; even the gangs in Chicago have over 300 positions to fill. These gang bangers will really appreciate the new health care plan coming out. You get pumped full of lead, you won’t need to worry about medical bills, and the hospital won’t either. Gang bangers will turn into hospital meal tickets; every procedure in the books will be run on them, before they’re mobile enough to escape (but I digress). As for the economy, Obama will point out that we’re not out of the woods yet (yawn). My wife’s and I each have $200 less a month in our take home pay after the Social Security reset. That's about $4,800 of consumption that isn't going to happen for an economy in recession. On the plus side, the food stamp program is a tremendous success, they have renamed it to SNAP (I’m not kidding) (Supplementary Nutritional Assistance Program). So I guess Obama can claim to have put a little SNAP into the economy without stretching the truth. It will be talk, pause and applause, over and over again. This is definitely not a beer, pizza, and chicken wing event. 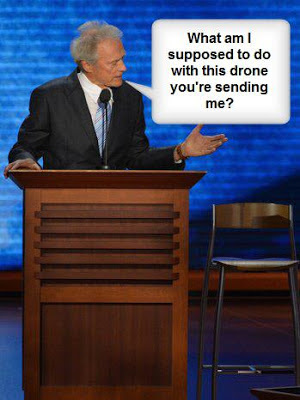 Obama’s State of the Union speech will be followed by a Clint Eastwood special “The Republican Rebuttal” staring Florida's Senator, Marco Rubio (It won’t be as funny as the last one; I think they sold the chair). If we review the Presidents last four years, a lot of Obama’s cabinet has moved on. It tends to suggest that these people felt their input wasn’t of much value and/or four more years of the same thing just wasn’t worth it (we’re not talking 20k a year jobs either). It will be interesting to take note of what is not talked about next Tuesday. The people who have left the oval circle are tight lipped. I guess the thought of a drone circling the house might keep it that way. I was listening to Suze Orman the other day. She was advising retirees to buy stocks with dividend yields to supplement their retirement income, since the bond market is returning so little interest. It kind of caught me by surprise. To paraphrase her, you need to take some risk on stocks because the return on bonds coupled with inflation forces the retirees to dip into their principle for living expenses. The real estate market kind of bit the dust a while back, and there are still millions underwater wishing to unload their burden on some greater fool. I’ve mentioned before that rich people don’t have to wait for a good economy to buy a home, so no wonder home prices are rising. These people aren’t buying starter homes either (which would lower the housing price average). The bond market has gotten so risk-less, that investors are almost paying borrowers to borrow money. Kind of reminds you of that company Solyndra that went BK, even with a Presidential endorsement. They didn't run out of money, they ran out of ideas on how to spend it. In the 1929 crash, we had new and growing companies on the horizon, the light bulb (GE), radio (RCA), the automobile, the airplane, electricity, indoor plumbing, washing machines, cash registers, telephones (ATT) and more. RCA went from $18 dollars a share in 1924 to over $500 in 1929 and back to less than $3 per share in 1932. And that was when $750 dollars was a year's wages. 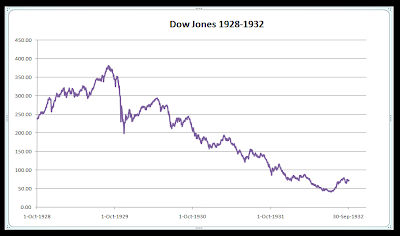 The years 1926 thru 1929 were miserable years as far as our economy was doing, but yet the stock market went up. Reality finally set in unannounced. 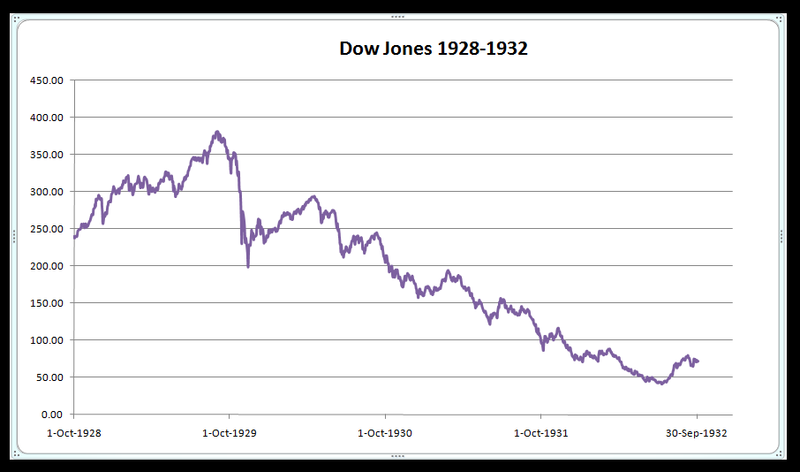 See below graph for stock performance in the 1930’s. Our present economy is a mess while the stock market is hitting new highs. Several countries are repatriating their gold stored abroad. Kind of makes you wonder what to expect even if things start to improve. The really big thing to watch this year is the tax increases. Will they bring in the expected revenue? The answer is probably a big NO. That's what happened in the 1930’s when taxes were raised. So we get to experience what our grandfathers lived through. And remember, this time it will truly be different; it’s me, not my grandpa paying the bills. Priceline looks like a good buy, 100 shares is only $68,000 and that's cheaper than 100 Google at $78,000. Maybe I should wait awhile; they could drop a bit like RCA did, way back when.